A new online platform based in Troy creates visual job postings in minutes. J oe O’Connor’s career path began in Boston, where he helped plan America’s Bicentennial in 1976, including preparing celebrations and welcoming such notable guests as President Gerald R. Ford, Queen Elizabeth II, and Sen. Edward M. Kennedy. Now, four decades later, after co-owning a yogurt chain, operating bakery franchises, overseeing a database firm, and developing and managing customized software at Kalpa Systems Inc. in Troy, which he launched in 2001, O’Connor is tapping his marketing skills once again. Earlier this year, he and a team of programmers launched ViziRecruiter in Troy. It’s an online platform where text-based job descriptions are converted in minutes into colorful, visual branding statements. Here’s how it works: A job recruiter copies, pastes, and enters a text-based job description on ViziRecruiter’s website or via a mobile app. 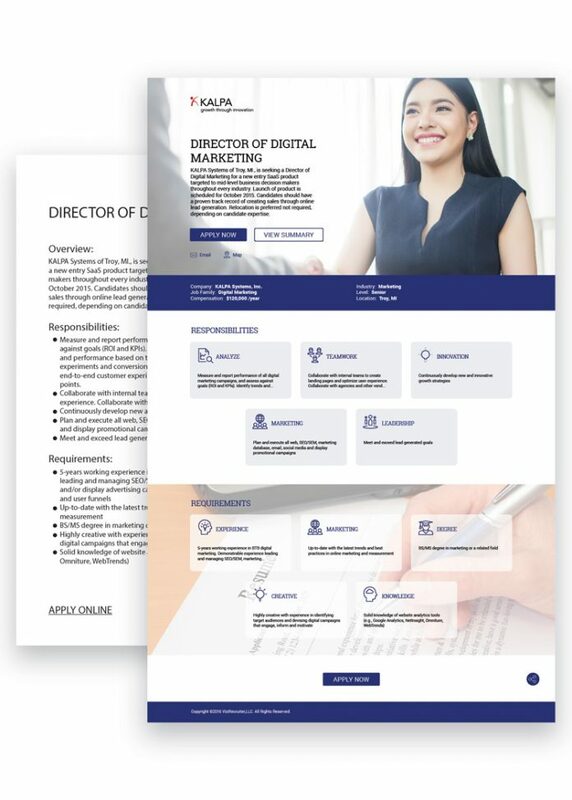 From there, the user selects a preferred design template of colors, fonts, and icons, and then, with the click of a button, shares the content with a specific job candidate or on social media. Once a job has been posted, a recruiter can track the number of views on Facebook, LinkedIn, or other social media platforms using an online dashboard that shows which keywords and visuals are causing candidates to take action. Simple to use, the fully-automated program in which edit changes can be made quickly, had a soft launch in May, and will be fully rolled out next year. The company has six employees, and plans to have a team of 15 workers by next spring.